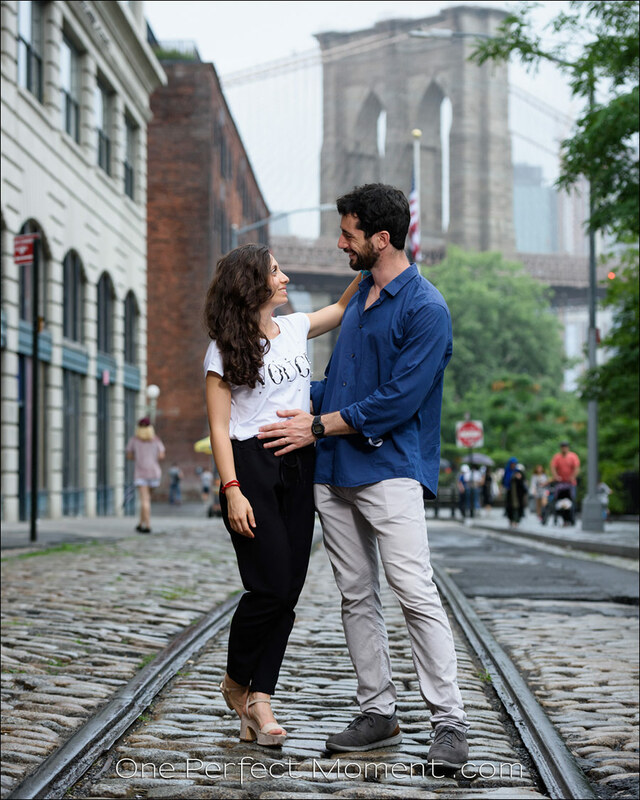 Angela and Fabio are from Rome, where they were married and then visited the USA for their honeymoon. 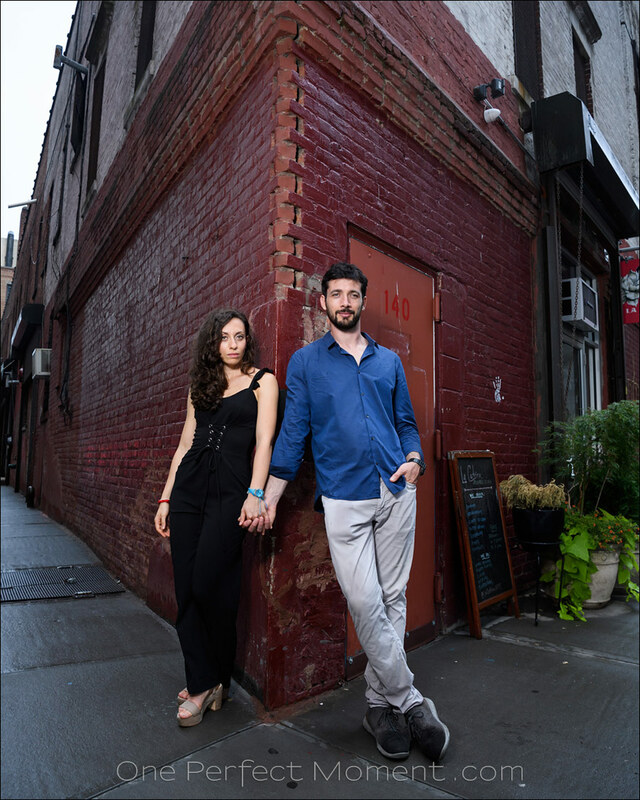 For their stop-over in New York, they wanted to include a photo session with a distinct New York City feel. Since they only had a day and a half for their visit to NYC, I had to be efficient. 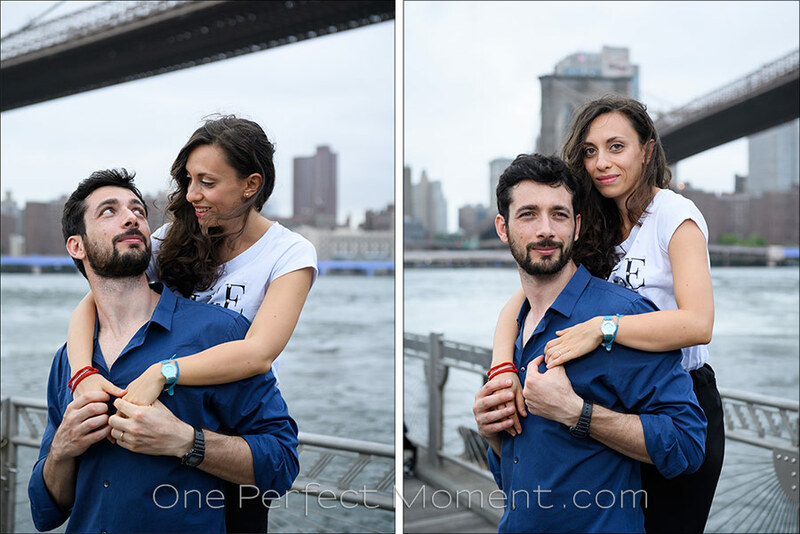 I took them to the Brooklyn waterfront because there is the magnificent view of the New York skyline. From there we had various vantage points and interesting spots to take photos of the two of them. 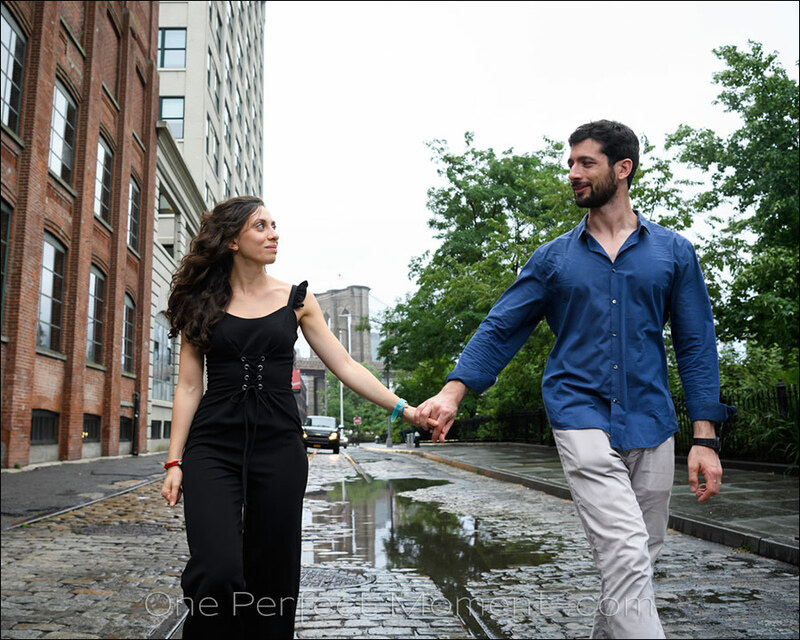 We rained out a bit, as you can see from the rain splotches on Fabio’s shirt … but we still made the photo session count! It was all part of the adventure. During the worst part of the downpour we took shelter under the one arch of the Manhattan Bridge where we continued as the flea market vendors were packing up. 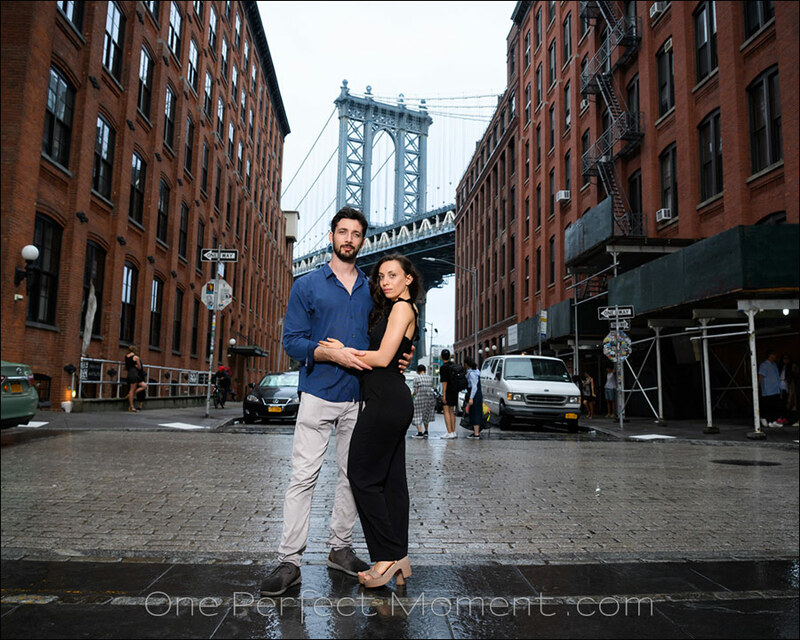 We also used the local color like graffiti walls, and the carousel on the Brooklyn Waterfront. And of course, that classic view down Washington Street with the Manhattan Bridge dominating in the background. A little more about the technical aspects of the photo session – I invariably bring an assistant with additional lighting, to give studio quality lighting on location where necessary. On a grey, rainy day like this the additional light from an off-camera flash, was essential to pop the colors and give some sparkle to the eyes, and life to the photographs. 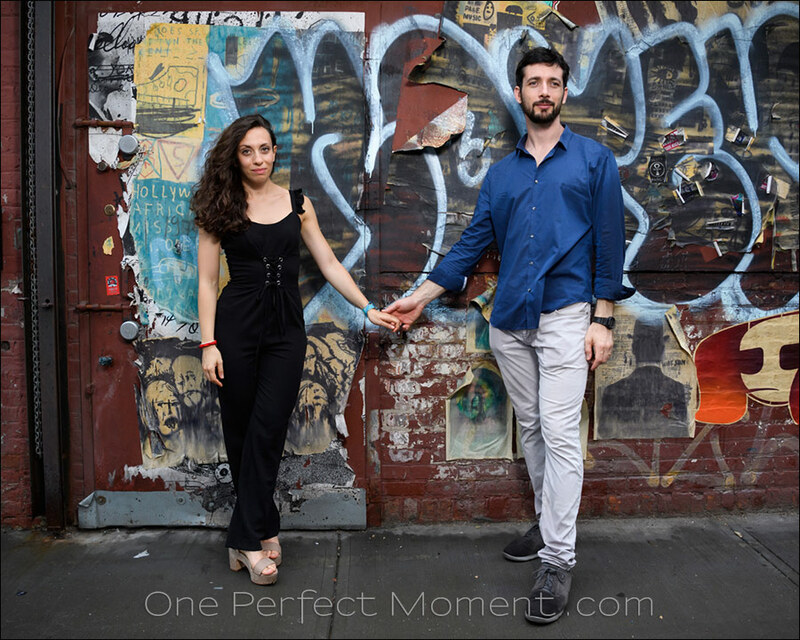 And of course, it really helps when you have a couple that is fun to photograph, and are easily affectionate with one another. Angela and Fabio, was a pleasure meeting you. Enjoy the rest of your trip here.